Android Tablet Computers to Secure 15% Market Share in 2011: Based on a recent study, IMS Research, has predicted that Android-powered tablet computers will grab 15.2% market share in 2011, and may reach 28.4% in 2015. They also said that 15 key manufacturers, including Acer, Cisco, Dell, Motorola, Viewsonic, and Samsung, are expected to release and sell their own Android-based tablet PCs by mid 2011. 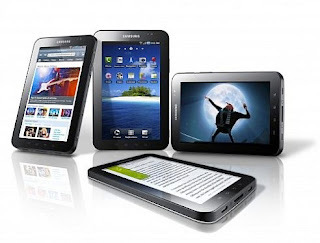 The highly anticipated Samsung Galaxy Tab is expected to strengthen Android's presence in the United States and could pave the way for other Android-powered tablet computers. According to Samsung’s forecast, a million Galaxy Tab will be sold during the holiday season alone, which is an outstanding number considering the Apple iPad has already gained significant ground in the US market. As stated by IMS Research, tablet PCs running other OS aside from Apple OS, Android or Windows will only get around 7% share in 2011. Meanwhile, Windows-based tablet will constitute for very small percentage of tablet shipments during the next couple of years. With the way Android is dominating the smartphone market right now, I won't be surprised if it will someday lead the tablet PC industry. In fact, Google Android operating system is quietly running on a good number of tablet computers (see: affordable Android-powered tablet computers and latest Android Tablet PCs) for several months already. IMS Research is a leading independent supplier of market research and consultancy to the global electronics industry. Visit the company's website HERE to view the full research report. Your picture here doesn't seem to be Samsung Galaxy Tab.I think it is "adam" from Notion Ink. Android on tablet computers will become as dominant as Windows on desktop PC in the near future.